Crypto VIP Club Scam or Legit? RESULTS of the $250 Test. Is Crypto VIP Club a Scam? YES! Crypto VIP Club’s claim that all users make at least $2,500 per day is ridiculous. If that’s true, why wouldn’t everybody invest this way? The “real user testimonials” are delivered by internet actors. The “real time” results on the website repeat on a constant rotation. Choose a legit bitcoin robot today by visiting this link. What is Crypto VIP Club, and is it a Scam? Basically, Crypto VIP Club is a scam that promises zero-effort investment returns for investors. It makes the claim that there’s a magical algorithm that understands cryptocurrency trading markets. The algorithm can make trades faster and more accurately than any human. Investors, the site claims, who put their money into the system will be rewarded hundreds of times over, even if they don’t even know what cryptocurrencies like Bitcoin really are. What really happens when users create an account is that they get connected to Binary Options broker websites. These brokers are sort of like the online casinos of the investment industry. The people who run these sites make tons of money in trading fees, and while the occasional person might get lucky, users lose much more than they win. This is especially true for people who don’t know what they are doing. The “Auto-Trade” feature of the Crypto VIP Club is just meant to make these trades happen as fast as possible, before new users realize that they’re not making money like they were promised. These websites are a dime a dozen. They pretend to be sponsored by celebrities. They promise instant riches for people who act now. In reality, they’re scams aimed at people who know absolutely nothing about investing, but who are roped in by cryptocurrency investment hype. In the rest of this review, we’ll show you all of the ways we can tell that this is a scam, just by information and images on the website. Who Founded Crypto VIP Club? So who founded Crypto VIP Club? Well, if you go to the website (which you shouldn’t), you’ll see an auto-playing video that introduces a young man named Andrew King. King is well dressed, good looking, and seems to be of Asian nationality or descent. The problem is, “Andrew King” is actually an actor photo taken from a stock image site. Don’t believe us? Look at the proof! This is a common tactic for these websites. A “genius” founder is concocted by combining a generic name with a generic stock photo. 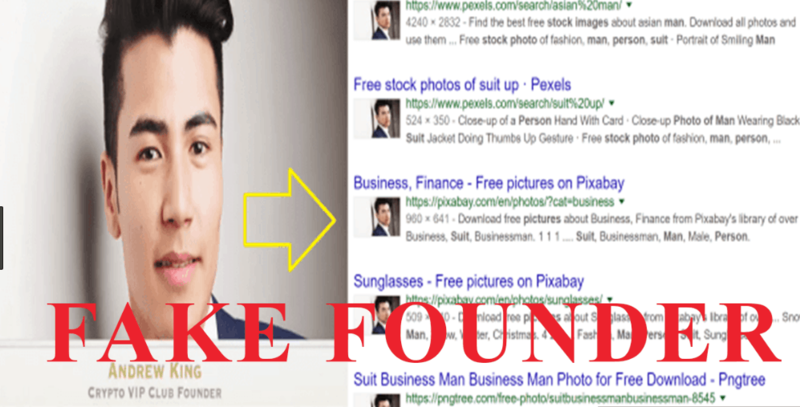 Searches through LinkedIn and social media will reveal that no such person exists, and perusal of stock image sites will reveal that this image is not of the person described in the site. The Crypto VIP Club scam needs a “Genius” founder, because their users need to believe that the fantastical algorithm, upon which the whole scheme is supposedly based, really works. Of course there is no such algorithm. Nobody actually knows who really founded this shady site, or the dozens out there just like it. We like to think that the true founder isn’t as photogenic as the stock photo model chosen for this site. The only photo we’re ever likely to see of the true founder would be a mugshot. So is Crypto VIP Club legit? No. Not at all. But don’t take our word for it. Let’s look at different items of proof that anyone can see and appreciate. If you still believe in this scam at the end of this review, you have only yourself to blame. When you go to the website for the first time, you’ll be greeted by a long auto-playing video. This video gives the whole scam pitch, and it includes video testimonies from some of the VIP Club’s supposed users. A quick trip to Fiverr.com will reveal that these “users” are actually paid actors, who create video based on scripts. These folks are working for just a few dollars for every video they make, so it’s easy to see 1) that these are obviously not real users, and 2) that the Crypto VIP Club budget must be very low indeed. Not only is this evidence of the falsehood, it’s also proof that whoever owns this website thinks that its users are not very smart. We don’t like sites like these that try to take advantage of people and steal their money. Don’t be taken in by phony actor portrayals! One common tactic of phony crypto robots like this one is to make claims about media and celebrity endorsements that don’t actually exist. Here we have the claim that CNN, Forbes, the Financial Times, and TIME all featured Crypto VIP Club. A very short jaunt through the internet archives of these media giants will reveal that none of them have ever so much as mentioned this skeezy investment scam. The Crypto VIP Club is a bit more subtle than some of its scammy peers. Most of the other crypto robots we cover make claims like “Elon Musk uses this crypto robot” or “This crypto robot was featured on Shark Tank and Dragons’ Den”. Those are bold claims that are easily disproved. Simply putting the images of major media outlet sets a lower, and somewhat more convincing bar. It doesn’t take long to prove that Elon Musk doesn’t use crypto robot scams, but someone who’s new to this kind of thing might not know how to check and see if this trading robot was ever featured in the entire history of CNN, and all of its media outlets. Just trust us that Elon Musk, Martin Lewis, or any other major celebrity has ever used this crypto robot. A little farther down the page, we’ll see that Crypto VIP Club also claims to show winning trades in real time. If you sit down and watch these trades for just a couple of minutes, you’ll notice them start to repeat themselves. In reality, this is just a loop of faked transaction records, with a clock timer that syncs with local time. It’s only convincing if you stay on the page for just a second, and are inclined to believe what you see without question. In reality, it should be suspicious that this investment broker would post live user data like this for all the world to see. Why would “Ruby” want people to know she had won hundreds of dollars just now? Shouldn’t that be confidential? Maybe “Ruby” wants her newfound riches to be a secret so that friends and relatives don’t start asking for money. Real fintech companies work hard to keep user data safe. They won’t give out your name without asking first. Of course, these users aren’t real people, so their rights can’t be infringed upon. But even the suggestion of this kind of behavior should show you that this is a scam trading robot. While we’re on the subject of fake users, let’s take another opportunity to look at how Crypto VIP Club’s “founder” is actually a stock photo model named Royal Anwar. Mr. Anwar might not even know that his likeness is being used to rob naive investors of their cash. Unfortunately, this is the reality. There are plenty of other examples on the simple homepage of stock photo models being used as “users”. “Kim Armstrong” is actually a model named Lise Statelman. 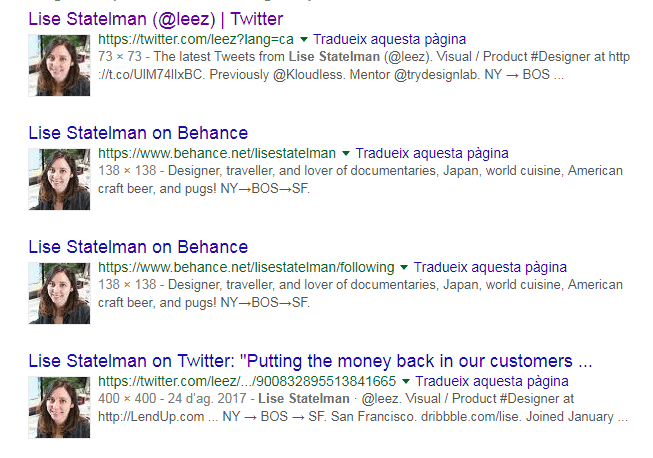 You can see Statelman’s various accounts in the Google search image above. Beneath, we have the phony testimony of “Kim Armstrong” below. While we’re here, let’s look a bit more closely at this testimony. Here, she calls the founder of Crypto VIP Club “David”, even though in other places the website calls him “Andrew”. This scam site can’t even keep their simplest stories straight – just more evidence that this is not the kind of investment you should be making. Have People Made Money With the Bitcoin Code? While we’re not saying it’s impossible to make money using binary options, these sites are always skewed to favor their operators, not the users. Just like casinos, the house always wins. However, by creating the scam site that masks these binary options sites, this introduces an extra layer of deception. 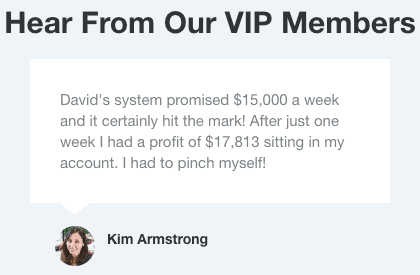 People who are good at binary options trading definitely don’t use scammy fronts like Crypto VIP Club, and the people who are fooled by this marketing material are very likely to lose money. We haven’t found any negative testimonials about this broker in particular, but it is just one scam among dozens. 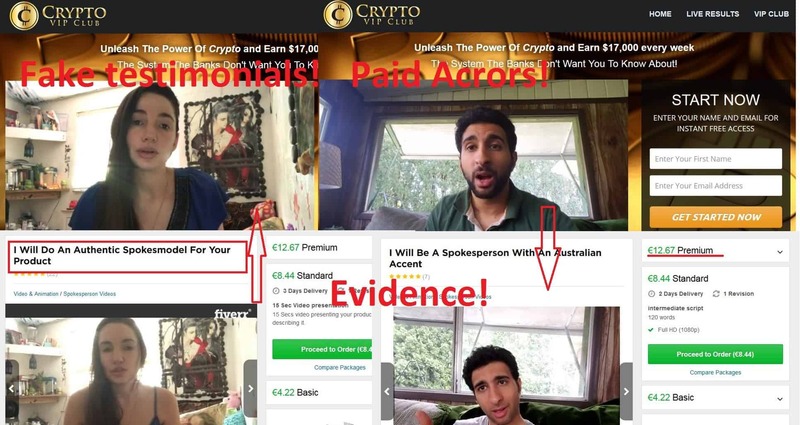 If you search for crypto market scam reviews, you’ll find plenty, and various forums like Reddit will have testimonials from people who got burned. We don’t like our readers to get swept up in crypto robot scams. That’s why we’ve thoroughly tested high quality crypto robots like Bitcoin Code and Bitcoin Profit. These alternatives have much more convincing websites, user testimonials, and media penetration than Crypto VIP Club. They may make some big claims, but these are crypto robots that can back them up! Here are a few ways for you to learn how to spot winners in this crowded industry. Is the media talking about the bot? As we’ve already seen, no media outlets or celebrities are discussing Crypto VIP Club. The alternatives we’ve mentioned get plenty of media attention. Only work with trading robot companies that answer all of your questions. The website we’ve analyzed today leaves so many questions unanswered. Never risk money if you have any suspicions about how a broker actually works. Only choose companies that have real founders. If you think that a founder, or the team behind a company, might not be real, go with another company. So try Cryptosoft today by clicking the link below and start earning real profits! Crypto VIP Club Review: the Verdict! Crypto VIP Club is most certainly a scam. We like the Bitcoin Code and the Bitcoin Loophole much better, as do people who have used both sites. Keep your eyes wide open and avoid sketchy websites that promise the moon. Most of these will end up stealing your money. Now that you know Crypto VIP Club is a scam, you’ll know how to spot other crypto robot scams, without ever having to risk your cash. Does Crypto VIP Club Actually Sell Bitcoin? No. Robot scams like this don’t even sell real Bitcoin. They just connect their users to sites that basically enable gambling on the value of these digital assets. There’s always a chance that a user might win some of these trades, but with automated trading the odds are not high. Most people lose all of their money, and never even have any Bitcoin to show for it. Are Crypto Robot Scams Based in the United States? It’s impossible to know exactly where all of these crypto robot scams are started. Because lots of these sites have misspellings and other mistakes, it’s easy to imagine that they might be owned by people outside of the United States. But because the people who run the site might just as easily have hired cheap foreign labor to write the marketing material, the founders might also be American. Which Celebrities Are Most Often Associated With Crypto Scams? To be clear, we’re not aware of any celebrity who genuinely endorses scam products like these. However, people like Elon Musk and Martin Lewis are frequently cited in scammy marketing materials online. Shows like Shark Tank and Dragons’ Den are also mentioned all the time. If something you read online is using names like this to get you to risk money, stay far away. No, Bitcoin is not a scam. Lots of people have made (and lost) money trading Bitcoin. The recent Bitcoin market downtrend doesn’t mean that Bitcoin is a scam, though BTC is definitely a very risky investment. Are There Real Bitcoin Trading Robots? Yes. Real crypto trading robots are usually much less interested in douchey marketing than the scams. Real trading bots have varying levels of success. They’re also typically only used by people who have a lot of knowledge about technology and crypto investing. If you don’t have that expertise, better to avoid the entire industry. How Can I Minimize Risk if I Try a Crypto Robot? If you think you’ve found a good crypto robot, try the demo account before you risk money. If you’ve tried that, or if no such option is available to you, just deposit the bare minimum the site allows. Sometimes this minimum isn’t that small, and may be several hundred dollars. If this is the lowest amount it’ll let you deposit, you’re almost certainly dealing with a scam. Avoid at all costs.